Everyone loves a parade! The Washington, DC area hosts several holiday parades throughout the year. These family-friendly events bring the community together for a celebration of history, culture, and patriotism. Each parade includes a procession of marching bands, local and national community organizations, floats and sometimes large balloons. Here is a calendar of annual parades held in Washington, DC and the suburbs of Maryland and Virginia. Chinese New Year Parade: Begin the new year in Chinatown, Washington, DC with Chinese dragon dances, live musical performances, and more. The celebration is dedicated each year to one of the twelve animals of the Chinese Zodiac. George Washington Birthday Parade: "The largest Parade Celebrating Washington’s Birthday in the USA!" is held each year on Presidents' Day in Alexandria, VA.
St. Patrick’s Day Parades: You don’t have to be Irish to enjoy this celebration of Irish cheer! The parties continue into the afternoon and evening at the local Irish pubs throughout Washington, DC, Alexandria, and Manassas, VA and Gaithersburg, MD. National Cherry Blossom Festival Parade: This parade celebrates the arrival of spring and the gift of 3,000 cherry trees that the city of Tokyo gave to our nation’s capital. The parade is one of the highlights of the annual spring festival in Washington, DC. Memorial Day Parade: This Washington, DC parade honors those who have died serving our country. Members of every branch of the military participate in this patriotic celebration. Rolling Thunder Motorcycle Parade: Thousands of motorcycles parade through Washington, DC calling for the government's recognition and protection of Prisoners of War (POWs) and those Missing in Action (MIAs). This is a long-time Memorial Day weekend tradition and one of the largest parades in the nation's capital. Hometown Holidays: The community Memorial Day celebration takes over the City of Rockville, MD with local military and cultural groups entertaining the crowd. 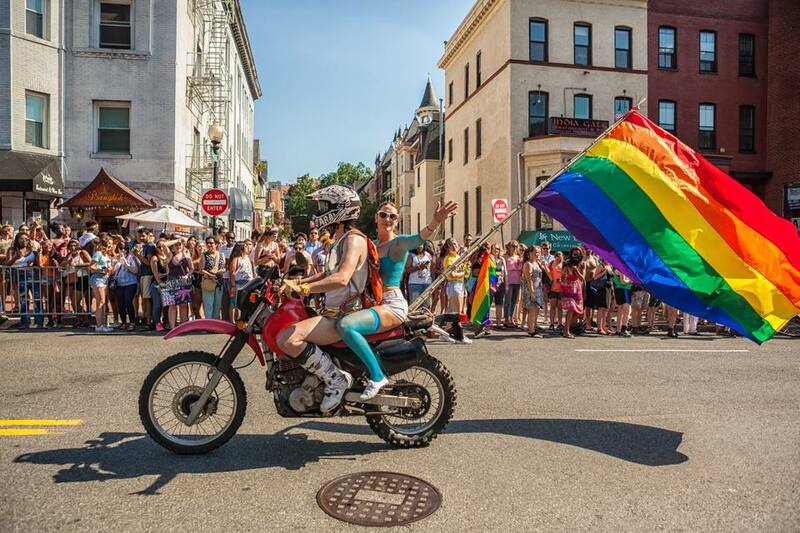 Capital Pride Parade: The gay and lesbian community shows their spirit with an annual parade and street festival. The event takes over the Dupont Circle neighborhood of Washington, DC for the weekend. Independence Day Parade: The nation's capital celebrates the 4th of July with a patriotic parade featuring marching bands, military groups, local and national community organizations, floats and large balloons. 4th of July Parades in DC, Maryland, and Northern Virginia: Many communities around the region celebrate the Independence Day holiday with a parade. Baltimore-Washington One Caribbean Carnival: An annual Caribbean style parade and festival celebrates Caribbean culture with colorful costumes and lively entertainment. Labor Day Parades: Celebrating Labor Day and marking the end of summer. These parades are an annual tradition for the local communities of Gaithersburg and Kensington, MD. Manassas Veterans Day Parade: Manassas, VA pays tribute to all veterans and active military with a community parade through the historic area. Local military and community groups march on the procession. Thanksgiving Parades: Turkey Day celebrations feature a variety of local groups and seasonal characters in Reston, VA and Silver Spring, MD. Scottish Walk Parade: Hundreds of Scottish clansmen with their bagpipes gather for the traditional favorite Scottish Walk Parade. This is a long-time favorite event in Old Town, Alexandria, VA.
Alexandria Holiday Boat Parade: Dozens of festively decorated pleasure boats light up the sky along the Potomac River in Alexandria, VA to celebrate the holiday season. Eastport Yacht Club Parade of Lights: During the annual holiday tradition, boat owners show off their Christmas light decorations through the Annapolis Harbor. Manassas Christmas Parade: The old-fashioned Christmas parade kicks off the holiday season in the Northern Virginia town of Manassas.